4 August 2014 – Ellesmere Port’s Whitby Road has welcomed yet another new business as Montague Café opens its doors. Run by local CIC Access2Training&Employment, the cafe offers healthy food and non-alcoholic drinks at affordable prices, in an environment that helps to bring people together promoting friendship and community spirit. Montague will provide training and work experience opportunities for young people looking to work in the catering industry and also has a stage and licence for musical events – creating a hub and podium for local talent. Officially opened by Andrew Miller MP, the event was also attended by local residents, Mayor of Ellesmere Port, Councillor Brian Jones; Executive Member for Localities, Councillor Lynn Riley and local ward Councillor Justin Madders. Gary Williams, of CIC Access2Training&Employment, said: “Montague aims to ensure that everyone in the local area has the opportunity, ability and confidence to access a healthy and acceptable diet for themselves, their families and their communities. We do this by supporting work with and within low-income communities that address health inequalities and barriers to healthy and affordable food. “The opening was extremely well attended by many agencies that have supported the venture and particular thanks must go to CWAC who have supported the project wholeheartedly from its inception. Cheshire West and Chester Council launched a project in 2012 looking to target long-term vacant shops in the old high street of Whitby Road. The grant scheme aims to bring properties back into use, improve the appearance of the street, help increase footfall for the other shops, and support the regeneration of the wider area. Montague is an important piece in the jigsaw of regenerating Whitby Road, following the recent news that both West Cheshire Credit Union and Chalice Media Studios have opened their doors. Other projects in the pipeline are the P3 charity hub, Endeavour social hub for the elderly, and business incubator Seed. All the social enterprises, including the FabLab and the Paperboat Gallery, are supporting the growth of the local economy by linking with each other. Said Lynn Riley, Executive Member for Localities: ““Whitby Road had a considerable number of properties that had remained empty for a long time, something I know local residents said they would like to see change and I am delighted that we are now starting to see a real difference to the area. “We were able to make this grant available to landlords who can then offer peppercorn rents and it’s fantastic that such admirable community projects are coming forward to make the most of it. Richard Fleming, Branch Manager of Booker Catering which is supporting Montague with their corporate social responsibility opportunities, said:” Living locally its fantastic to see the effort and passion that has gone into opening this amazing community project. Gary is the most dedicated, committed and excitable person I know who wants to change the world, whether its one shop, cafe or house at a time. “It is an honour that we are able to support a local project that is changing a community and I look forward to building a strong business partnership with Montague supplying the goods that there team will transform into the food we eat, and fresh food and fruit to the people of Ellesmere Port. The high street regeneration is prioritised in the Vision and Strategic Regeneration Framework of the Ellesmere Port Development Board and supported by the Town Centre Improvement Advisory Body. 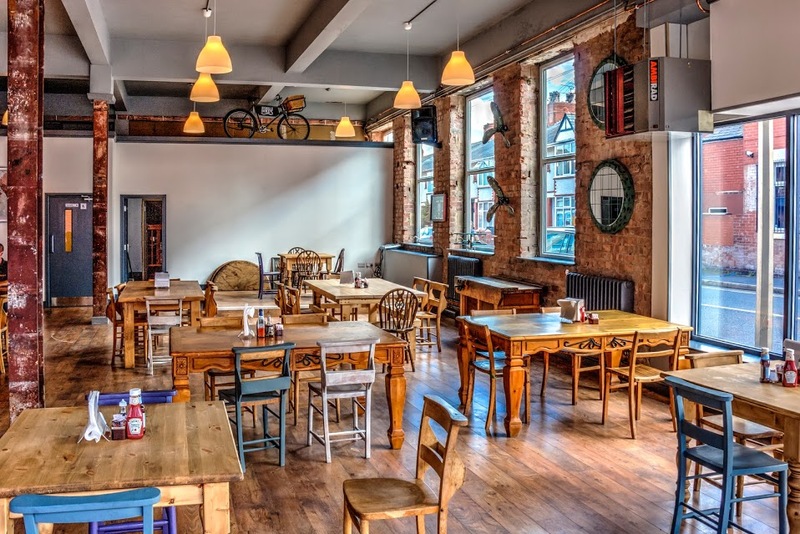 For more information contact Jochem.hollestelle@cheshirewestandchester.gov.uk, or visit https://montaguecafe.wordpress.com including a virtual Google Business View tour made by Ross Goldstein. Inside Montague café, courtesy of Ross Goldstein.